On a beautiful crisp winter's morning, nearly 2500 children ran the final 2.1km leg of the Rotorua Mini Marathon. The Mini Marathon is a fun, non-competitive event that doesn't have placings or timings. It has grown to attract 28 schools and nearly 2500 students after just 60 children took part at the first event in 2010. 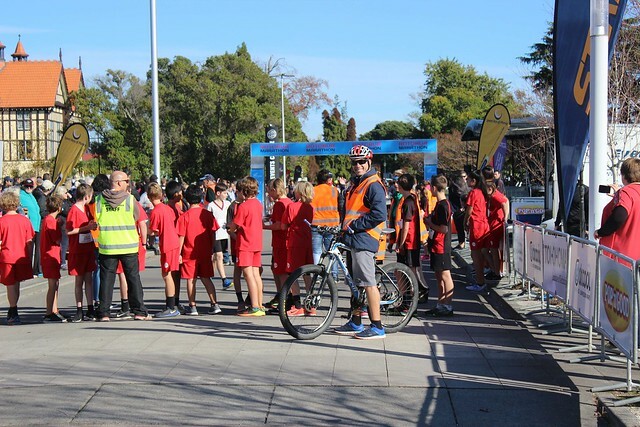 The event is run by Sport Bay of Plenty, Event Promotions (Rotorua Marathon directors), Events and Venues and Athletics NZ, with the aim of getting more primary school children involved in running events. The students run 40km over several months, accruing kilometres during this time, ahead of the final event - which is held on the same course as the Rotorua Marathon. For Kobe Stranks-Rose the event was great training for his other sporting activities. Among the first home, the Kaharoa School 10-year-old said he also took part in rugby, judo, waterskiing, boxing and crossfit. He said he prepared for the Mini Marathon by running around the Blue Lake with his parents, Tania Stranks and Warwick Rose, both of whom were there to support their son. "He's been able to beat us around the Blue Lake since he was 8," Stranks said. She said the event was great especially for children who didn't get the opportunity to be involved in many sports. Click the left and right arrows on the gallery below to view images from the day. To download one, click on it.